Most of us live a very regimented lifestyle, and society typically tailor things to the type A personality. Everything has to be in order, have structure and make logical sense. Which I totally agree with, I'm a very logical person myself and abide by all these guidelines... most of the time? 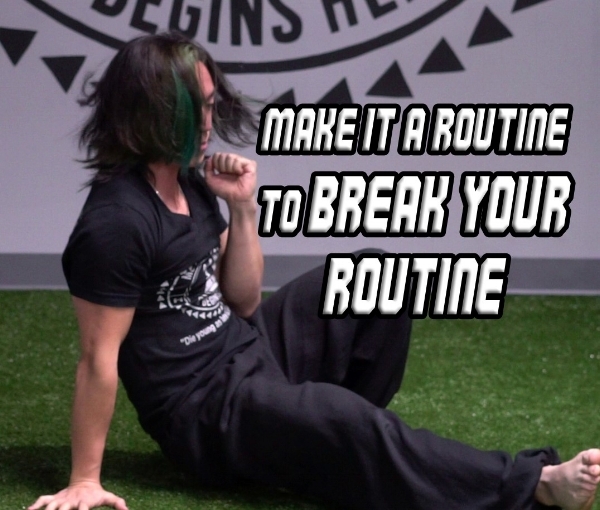 But what I've come to realize is this: While it's important to have a basic structure and routine for your daily lifestyle to keep consistency and productivity, it's equally important to break that structure and routine once in a while, probably more often than you think you should. As one sticks to structure for too long, tension builds up over time and your mind or body will naturally collapse, (getting sick, stress, depression, anxiety, angry outbreaks etc.) forcing you to reset and start over. This is why Vacations, diets, fasting, de-load/rest periods in workouts, on an off seasons in sports, lunch breaks etc. have been created. But this is generalized and not tailored to you. If you know me, everything I preach is about balance, personal customization and building our own intuition so we learn to know what is best for us, at any given time, whenever we need it. In regards to your workouts, there are general guidelines of course. The Fundamental Movements, number of reps, sets, duration, intensity etc. But remember, all these are simply Guidelines, not Rules. I challenge you to NOT just follow the list of exercises and abide by the reps, sets etc. But to keep working on the fundamental movements and base your workout, reps, sets, and duration depending on how you feel instead of what is on your "routine for the day". Of course, it takes time to build your own intuition because we tend to not pay attention to ourselves since we are so focused on external factors of life. So start the fundamental movements with a solid routine in the beginning. But once you get better at the routine, I challenge you to break the routine and listen to what your body is telling you, magical things will start happening and you'll end up knowing what you want to do to make your body feel better. Let's break free from the social norms of what you HAVE to do and listen to your body so you end up doing what you WANT to do.